Good point. You’re right – from the day we planted the pineapple top to today, this is about Day 2,230 for the pineapple plant. That’s what happens when your late bloomer takes its sweet time. I’l be interested to see if Spike adheres to the 20-24 month standard growth period, or if he drags his feet, too. But since I’m blogging about my baby pineapple’s bloom-to-fruit process, I’m only counting this as Day 40. And counting! Speaking of counting – Jonah Bear is totally counting on making a pineapple upside-down cake when this is over! My grandson, Jonah, asks me every time I talk to him if the pineapple is ready to make a pineapple upside-down cake with yet. It’s sad, but true – the pineapple’s fate has been sealed. What Jonah Bear wants, Jonah Bear gets! That’s pretty cool. I never realized each ‘section’ has it’s own bloom. But I’m thinking Pina Coladas to go with the pineapple upside-down cake!!! I know, right? 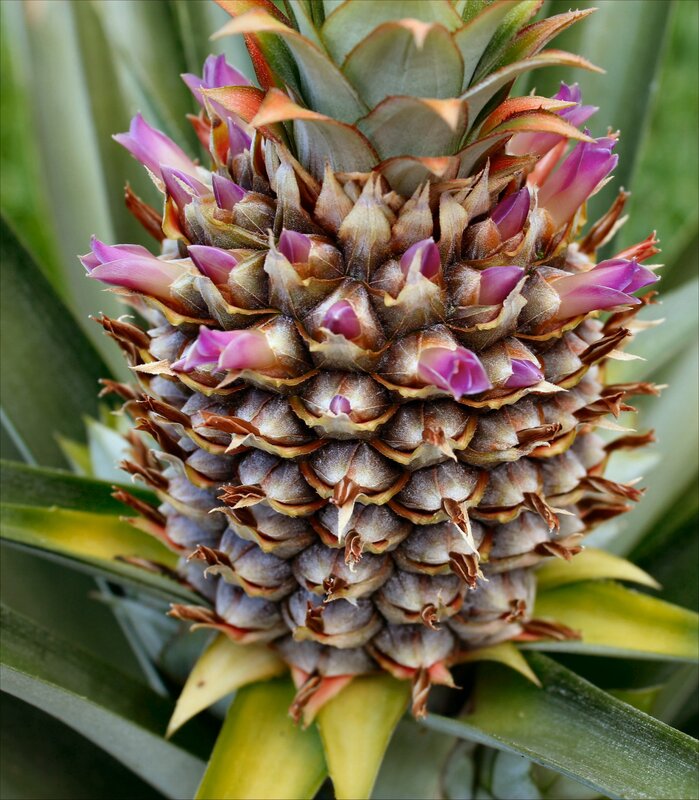 I had no idea pineapples were so pretty or that it was such an amazing transformation from little flower bud to edible pineapple. I’m amazed every week by how much our pineapple changes. The purple flowers by far are the most unexpected but wonderful surprise. I think our baby pineapple is beautiful! I’ve learned more about pineapples from you than… well, I’d never really stopped to think about them before, but I have a whole new appreciation now! Wow… I feel like Pinapedia! Just kidding. 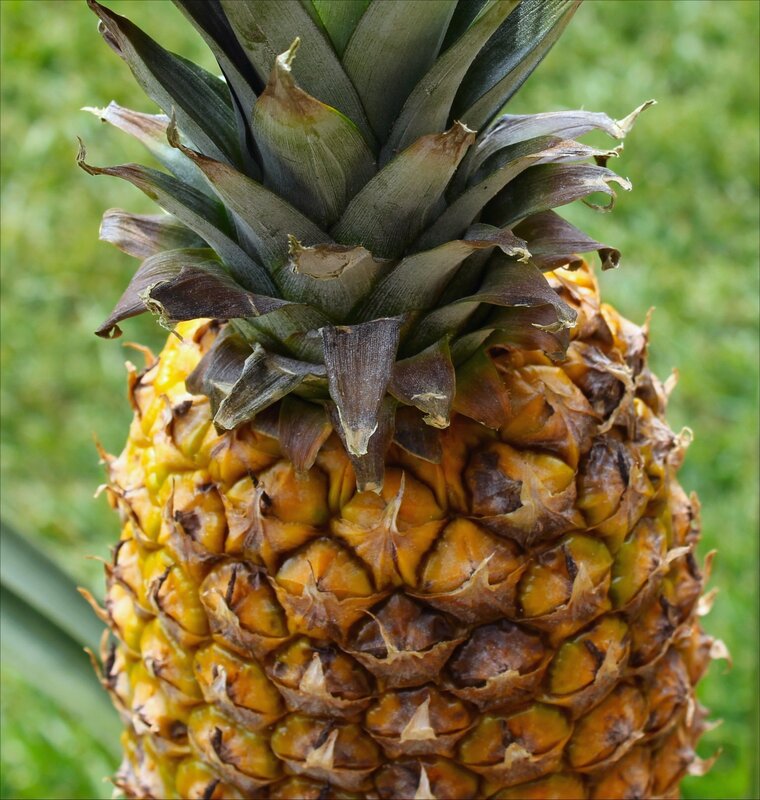 Pineapples are one of those fruits you just eat without thinking about how it grows. I have to admit, I used to just buy it in a can and not think about it at all. Now that I’ve seen it with my own eyes, I will always appreciate them. Much like bananas, which we also grow. When you’ve harvested your own giant stalk of bananas, you’ll never look at them the same way again. I’m just happy others are as fascinated with my little pineapple as I am. It’s the coolest thing I’ve ever grown. Cool! I had no clue about the flowers either. Seriously, flowers? I’m absolutely astonished by The Little Lady. Why didn’t we know about this part sooner? They would become every elementary school-aged child’s favorite fruit/plant instantly. I know, I know. It’s such a surprise to see those gorgeous purple flowers bloom. I had NO idea pineapples had purple flowers until we grew one for ourselves. How did we not know this? I need to post our banana photos from last summer’s crop. If you’ve never seen how bananas grow, they’re just as fascinating. Stay tuned! I can’t believe that I’ve lived to be older than dirt and never realized that a pineapple flowers. Logically, I know that it should, but its shocking nonetheless. Pink and purple flowers are my absolute favorites. 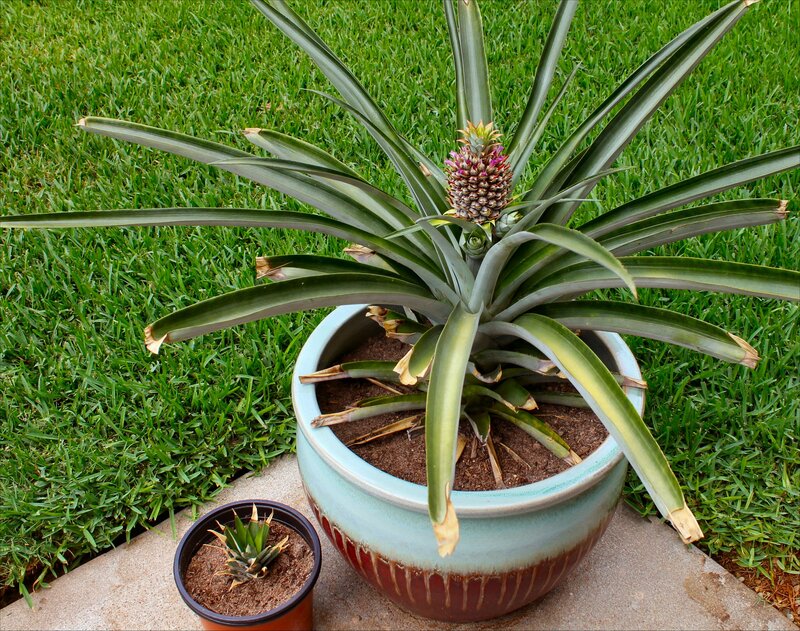 I wonder if I could grow a pineapple indoors? We are anything but tropical Up North. I am loving living vicariously through your pineapple, though. Very cool. I’m with Kandi & Big Sis–Pina Coladas are a must accompaniment to the upside down cake. I know, I know….me, too. If I hadn’t grown one, I’d never have known about the flowers. I’m amazed every week by our little pineapple. I think you should absolutely try to grown one! What do you have to lose? I’ve learned that they like full sun, so if you grow it indoors, put it next to a really sunny window and water it 2-3 times a week. If it works, we’ll toast your success with a pina colada!